My recent New York post went through the stores I managed to visit during my trip, but this post follows up on the details we all really care about - what I bought. Kinokunyia was a high priority visit during my trip. I had decided before visiting that all shopping from Kinokuniya would be focused on things that I couldn't, or were hard to get at home. Planning is all part of the fun / sickness. High up on my list was the Pilot Kakuno fountain pen. In the UK you can get hold of these beginner fountain pens but only with the dark grey barrel. I always thought the white barrels were much nicer. Luckily in Kinokunyia they a good rage of colours available. I opted for the Kakuno with the yellow cap and a medium nib. I have some ink on order from Jet Pens so once this arrives I will get this pen inked up and start using it. Alongside this I bought a few Zebra Midliners and some Japanese pencils. I was restrained with the pencil purchases because I would be visiting CW Pencils during my trip so I went for pencils that I didn't think I could get from CW Pencils such as the Mono J and Uni Stars. Below is a full run down of my shopping at Kinokunyia. A few days after Kinokunyia I visited CW Pencils where I went a little pencil crazy. The classroom friendly sharpener was high up on my shopping list, again, as you cannot get these easily in the UK. I went for this lovely pillar box red. I love this sharpener, I have never used anything like it. I tested out the Blackwings Volumes 725 on CW Pencils testing station. I was concerned about the graphite being too soft which stopped me buying these online. After testing them and seeing the gorgeous lacquer in the flesh, I decided I had to have a 12 pack. The packaging, like the pencil, is really well done. I am just glad I managed to grab a pack before they sold out. In addition to these larger purchases I bought a Baron Fig Apprentice 3 pack. The paper in the Baron Fig works well with pencils. I have used the larger Baron Fig Confident in the past, but not the pocket notebooks so I am looking forward to trying these out. And then of course come the pencils themselves. The wall of pencils in CW Pencils is kind of overwhelming. There are so many pencils on offer, and I did take quite some time dwelling over what to buy, studying the pencil wall 3 or 4 times. Despite the time I spent pacing I was fairly conservative in the number of pencils I bought. I bought with testing in mind - all part of the quest to find my perfect pencil. I wanted to try some different brands in the hope that I will find something I really like. Again, I also bought pencils that were tricky to get in the UK. Below is the final list. I bought a lot of pencils and pencil related items during my trip to NYC. Pencils a lot of the time do not feature within my stationery shopping and I hadn't planned on buying so many this time round. This means for the next few weeks I will be using pencils a lot more than usual. At the moment some big favourites of mine are the Palomino 725, the Tombow 2558 and the Mitsu-bishi 9000. In particular the 725 is so pretty and I am enjoying the graphite much more than I thought I would. The Classroom Friendly sharpener is amazing and is completely stealing the show. I cannot get enough of this and it completely blows away any other sharpener that I have. I have never had a pencil point like it. As I use these new additions and become more familiar with them I will be getting reviews up on The Finer Point. Greetings from Berlin! I am currently on a small mini break to celebrate my husbands 40th birthday and along the way I have stumbled across, and sought out, a few stationery shops which have surprised and excited me, therefore I felt that they were worthy of a blog post. This gem I found through All Things Stationerys wonderful world map of physical stationery goodness. RSVP is split into two halves, one store focuses on items such as notebooks, pens, pencils, scissors and utensils, and then you hop over the street where the second store is more craft related with wrapping paper, tapes, twine and cards. Both are really nicely laid out and entice you in to explore the delights they have on offer. RSVPs shelves are laid out with minimal product and cute name tags allowing you to browse and appreciate the items on offer. This isn't a groundbreaking store layout or style, but its great to see a stationery store using this to promote the joys of the analogue world. My husband and I both purchased a few items from RSVP, however I will save the details for an upcoming blog post. 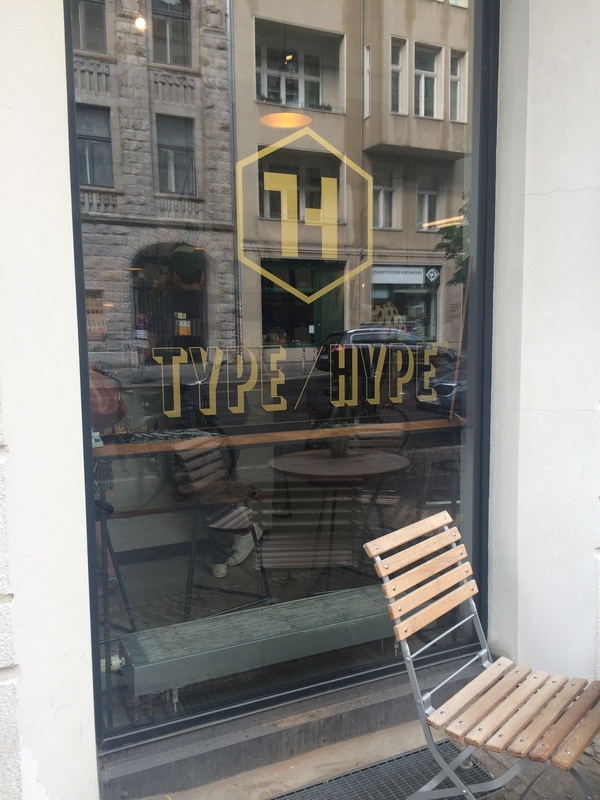 Type and Hype is a coffee shop and typography appreciation shop. You can grab a coffee and pastry whilst at the same time looking through a selection of notebooks, posters and crockery branded with different typographical lettering. The store includes an old letterpress but unfortunately is not in use and used more for decoration. Type and Hype source all their stationery items from within Berlin and Germany itself, which is quite a nice selling point. This shop is quite cool but it is limited to notebooks and a few pencils. I desperately wanted something more from the letterpress theme such as classes or an old workshop hidden in the back of the shop, but sadly this is not the case. 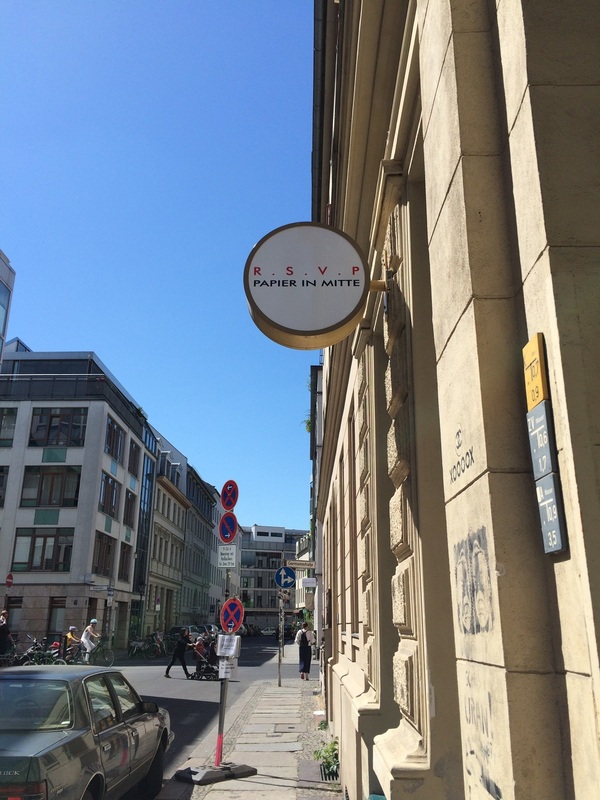 I was not tempted into buying anything from Type and Hype and what's more the coffee was just ok by Berlin standards. I like the concept of this store but there is definitely something lacking there for me. This stationery store was an absolute gem and the only unplanned store I found during my visit. 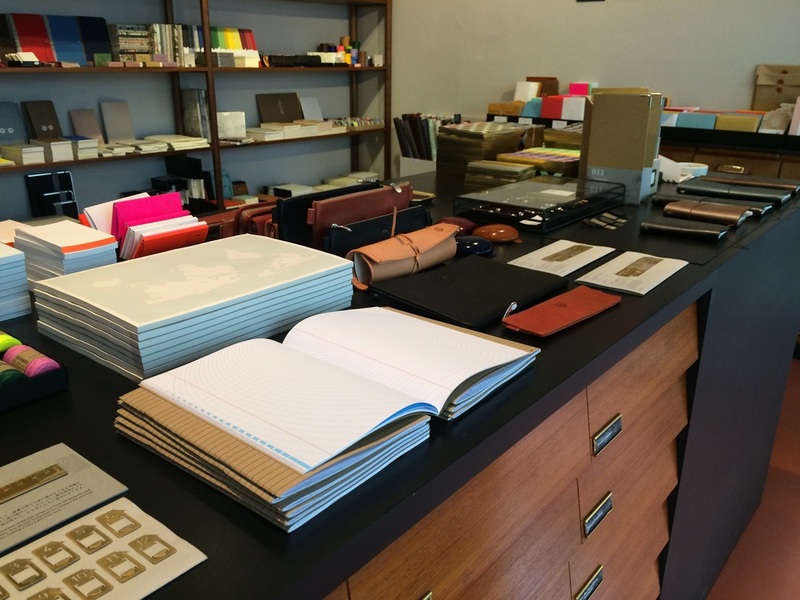 Luiban can be found on the same road as Type and Hype and holds a wide range of fantastic stationery. The table below is visible as soon as you walk through the store. Midori travellers notebooks, including the new Pan Am edition, leather cases, notebooks and a pen and pencil testing section are all covered in this area. It works as a great entrance into the store showing the broad array of products available. The shelving space visible in the below photo sits on the back wall stacked with lots of different paper and notebooks including Midori, Paper Supply and Lechtturm1917 to name a few. What struck me with Luiban is the really fantastic range of products they hold. I was able to look, play, test and ask numerous questions. As I paid for my items (yes there were quite a few), the store owner was kind enough to point out which paper was better suited to fountain pens or pencils and some tidbits of information about where they were produced. It really was an enjoyable experience and everything you should get from this type of store. Luiban were by far the most knowledgable of the three stores I visited in Berlin. One final element of Luiban I loved was the sneaky view of the back office area you see whilst paying. (My husband managed to get a photo which I am very grateful for.) It made me want to wander in and have a poke around, rummage through the draws and find any hidden treasures. Berlin has been a wonderful trip where I have been left surprised and delighted by the amount of physical stationery stores I have been able to find in a short space of time. The selection on hand is wonderful and for a stationery nut like me its really nice to see a major city embrace this, and seem to do well from it. Perhaps calling Berlin a stationery haven is a step too far, but to see multiple physical stores entice people in is an exciting prospect for our analogue world.